From a historical perspective, the idea that Europe and Asia were different “continents” came from the ancient Greek view that the lands to the east of Greece somehow made up a single, organic whole called Asia, while the lands to its west made up another whole, known as Europe. This view eventually became the modern Western understanding of Europe and Asia as separate continents. The idea of Asia as a distinct continent is problematic in both a geological and cultural sense. Geologically, there is no particular distinction between Europe and the rest of Asia; together, they sit on the same geological plate, the Eurasian plate. The Ural Mountains, which are traditionally considered the boundary between Europe and Asia, are moreover not very distinct and are hardly an impediment to the movement of peoples. South Asia, which lies on a separate tectonic plate and is separated by the far more formidable Himalayas, is actually physically much more distinct from the rest of Eurasia than Europe is (South Asia is also not too dissimilar in size to Europe, minus Russia). Culturally, Asia is also a problematic concept. What is Asia, other than a way of setting apart a group of non-Western cultures from the West? The West, is fairly well defined – to put it simply, it is a civilization that arose from Roman civilization, Christianized, and then went through developments such as the Renaissance, Enlightenment, and Industrial Revolution. But what, really, is Asia? It consists of cultures as diverse as Japan and the Arabs, who really have no more in common with each other than with Europeans. It can in fact be strongly argued that Islamic civilization is, in many ways, more similar to the West because of their related religious origins than to China. This is not to say that there are no common histories or cultures in Asia; rather Asia has many regions, each as distinct as Europe, which share their own commonalities, such as East Asia (Chinese civilisation and states influenced by Chinese culture such as Japan and Korea) or South Asia. Between these civilisations, there was, of course, some interaction so it is reasonable to see all of Europe and Asia as an interconnected system with specific sub-regions. It is important, in fact, to not worry too much about the exact definition of regions or continents, since doing so often creates mental boxes that obscure rather than clarify reality. A few decades ago, the idea of pan-Asian solidarity or brotherhood became popular in many parts of Asia, but this was the result of Asians internalizing a Western construct. It led to some beliefs, for example, in India that Indian and Chinese interests or patterns of thought were similar when, in fact, this was not the case. Connections between regions are also often obscured by the tendency to classify and separate territories into regions. It is not as if there is a sudden break in the cultures, or even genetics of people who live next to each other who happen to inhabit countries separated into different regions. For example, Greece is in Europe while Turkey is considered to be part of the Middle East (which is geographically in Asia, technically). Notwithstanding this, Greeks tend to exhibit cultural traits much more similar to those of the Turks than to Europe’s Swedes (for example). Iran and Afghanistan, meanwhile, share a common heritage and language but they are placed in different regions in most classification schemes, with Iran being part of the Middle East and Afghanistan in South or Central Asia. All this obscures the connections between regions in Europe and Asia and the fact that they generally gently transition into other cultures without there being huge breaks. A much more accurate way of looking at Europe and Asia is to consider them, geographically, all part of a single large landmass. However, since the major divisions within this landmass are cultural and civilizational, the descriptive terms within this landmass would have to reflect this fact. Thus, this landmass would either have several continents of which Europe would be one, or would have several regions, including Europe and many others. Different manners of division could emphasize civilization (Western, Islamic, Hindu, Confucian, and so on in Samuel Huntington’s sense) or common zones of interaction (the Mediterranean, for example). 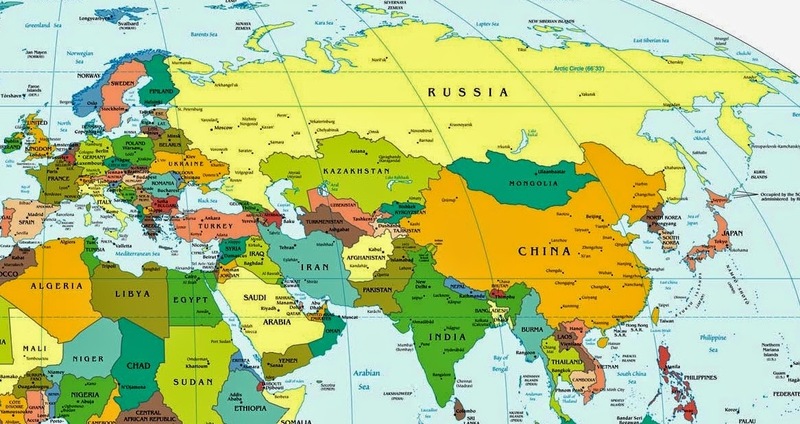 However, the simplest shorthand manner of describing Asia is to define it as a physical continent (including Europe) with approximately seven evolving regions, which balance geography and culture, and do not follow exact political boundaries: Europe, the Middle East (including North Africa), South Asia, Central Asia, Russia, East Asia, and Southeast Asia, with several transitional zones in between. The GeoTradeBlog does not believe that Asia holds any valid geographical or cultural meaning as a single whole. Rather, it sees a single geographical landmass, Eurasia, with separate and distinct regions, which is not to diminish the fact that these regions have all shared many common cultural and historical events and trends. Maybe dominant civilisations will always be defined by what they are, while others are given common identity by what they are not. In which case, as some nations in Asia rise to global ascendancy the notion of Asia will undoubtedly fade away. China is playing a significant role in helping Tanzania to become the regional economic power house of East Africa by providing financial support in development of major infrastructure projects. Tanzania's 坦桑尼亚 economic fortunes have been boosted by the discovery of vast natural gas reserves in the southern regions of Mtwara and Lindi, but it is China's investment that is helping to bring the new gas resources on stream as it is financing the major energy and infrastructure projects . China 中国is financing a US$1.2 billion gas pipeline project from Mtwara to Dar es Salaam, which is expected to be completed later this year. Once completed, Tanzania will start to export its power to its East African neighbours in 2015. In addition, China 中国 is also financing two mega-power projects at Kinyerezi area in Dar es Salaam, the Kinyerezi I and II which are expected to boost electricity generation for domestic consumption and export. 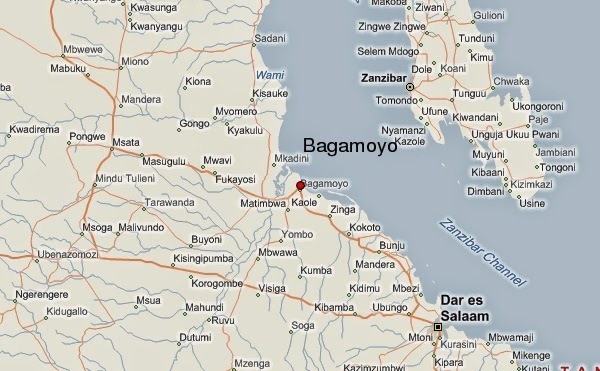 The Asian economic power house will also finance construction of a port, special economic zone and a railway network at the historical town of Bagamoyo on the coast in a project estimated to involve more than US$10 billion. It is against this backdrop that Tanzania is on course to become the East African regional economic power. Tanzania is soon likely to have the potential to become the regional centre for trade, manufacturing, logistics and IT upon completion of the major gas pipeline project and other mega electricity projects as well as the envisaged construction of Bagamoyo port. Tanzania also has the potential to become the regional centre of tourism due to its tourists attractions including two out of seven wonders of the world. Tanzania is home to Mt. Kilimanjaro which at 5985m it is Africa's highest peak and the world's tallest freestanding mountain. 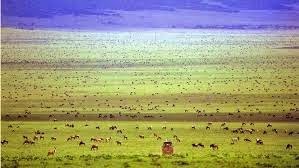 It is also home to the Serengeti National Park, famous for its annual migration of over 1.5 million white bearded wildebeest and 250,000 zebra. China is also working with Tanzania to improve tourist infrastructure such as hotels and transport services to make it an even more desirable tourist destination. In early February 1848, following a short and one-sided war, México agreed to cede more than half its territory to the United States. An area covering most of present-day Arizona, California, Nevada, New Mexico and Utah, plus parts of several other states, was handed over to the US. The rebellious state of Tejas, which had declared its independence from México in 1836, was recognised as American soil too. But a century and a half later, communities have proved more durable than borders. 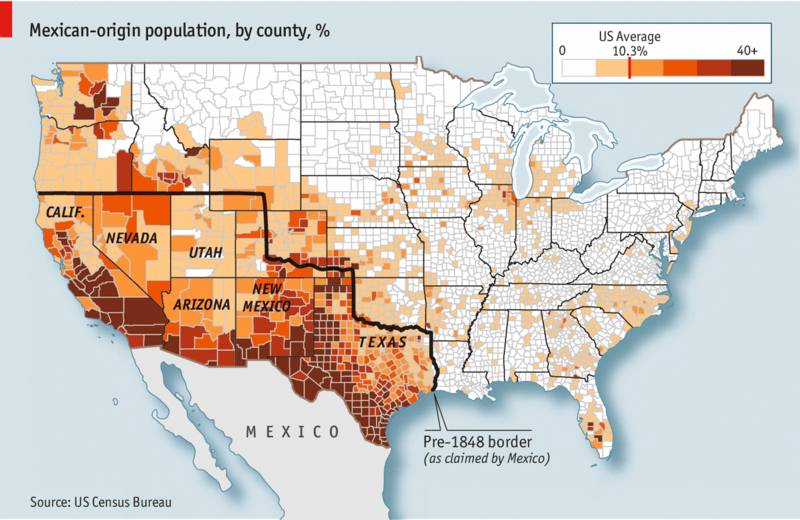 The counties with the highest concentration of Mexicans (as defined by ethnicity, rather than citizenship) overlap closely with the area that belonged to México before the great US land-grab of 1848. Some are recent arrivals; others trace their roots to long before the map was redrawn. They didn’t jump the border—it jumped them. 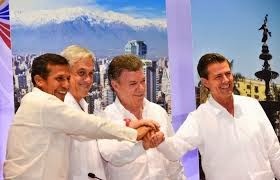 The Alianza del Pacífico agreement signed on 10 February 2014 aims to eliminate most trade and non-trade barriers between Perú, Chile, Colombia and México and also improve the mobility of capital and people. It will also reduce members’ export dependence on single goods (in the cases of Peru, Chile and Colombia) or single markets (as in the case of Mexico), and will create economies of scale that will make it easier to compete with Asian markets. The landmark framework agreement covers a wide range of topics, ranging from the elimination of trade and non-trade barriers on 92pc of the goods traded within the bloc to the adoption of measures to improve the mobility of capital and people. The countries making up the trade bloc have a combined population of over 210m people, a total GDP of US$2trn (and a per-head GDP in excess of US$10,000) and account for around 40pc of all foreign trade and inward foreign investment flows to the Américas (not including the US). 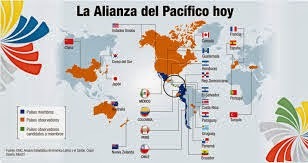 The Alianza del Pacífico is due to increase shortly with Costa Rica just been accepted to begin the formal membership process.In addition, the Alianza del Pacífico’s goal of strengthening ties with the Asia-Pacific region means that a broader trade bloc in the Américas will join ongoing talks to create the Trans-Pacific Partnership (a free-trade area comprising Australia, Brunei, Chile, Canada, Japan, Malaysia, México, New Zealand, Perú, Singapore, the US and Vietnam). The recent agreement has been welcomed in the countries of the Alianza del Pacífico, where it as seen as a massive opportunity for achieving complementarities among its members. México is set to strengthen its intra-bloc exports of value-added manufactures, such as automobiles and metal-mechanics goods. Colombia is expected to benefit from increased exports of basic manufactures, such as processed foods, clothing and leather. And Chile and Perú are likely to boost their cross-border sales of agro-industrial goods. Furthermore, the Alianza del Pacífico constitutes an opportunity to build strong intra-bloc competitive advantages to penetrate Asian markets. This would be achieved through the creation of productive chains that generate economies of scale. According to a study by the Inter-American Development Bank (IDB), these chains could include the production of fibres and carpets by Perú and Chile; phosphates and detergents between Mexico and Perú; wood, paper and cardboard between Chile and Colombia; and chemicals and plastics between Colombia and México. The Alianza del Pacífco’s success also hinges on its capacity to put in place accords in other, non-trade related areas. Progress has been made on the elimination of visas, the establishment of joint embassies in many Asian countries, and the subscription of agreements to promote education, tourism, small and medium enterprises and infrastructure investment. However, advances have been limited in more complex areas, such as the harmonisation of customs procedures, rules of origin and tax and financial sector regulation. The lack of progress in the latter two areas, for example, is delaying the implementation of the Mercado Integrado Latinoamericano (MILA, which aims to create a single stock market between Chile, Colombia and Perú and México). Finally, although it is clear that the Alianza del Pacífico does not have political motivations, Mercosur comprised of Argentina, Brazil, Paraguay, Uruguay and Venezuela and the Alianza Bolivariana para los Pueblos de Nuestra America (ALBA) which includes Antigua and Barbuda, Bolivia, Cuba, Dominica, Ecuador, Nicaragua, St Vincent and the Grenadines and Venezuela are likely to see the recent advances as a threat to their political ideology and existence. APEC continues to go from strength to strength, with an ever-expanding agenda, and an impressive share of the world economy held by its 21 members: this year, APEC accounts for 55pc of global GDP, 44pc of trade and 40pc of the world's people which shows just how dynamic and prosperous the region is becoming. 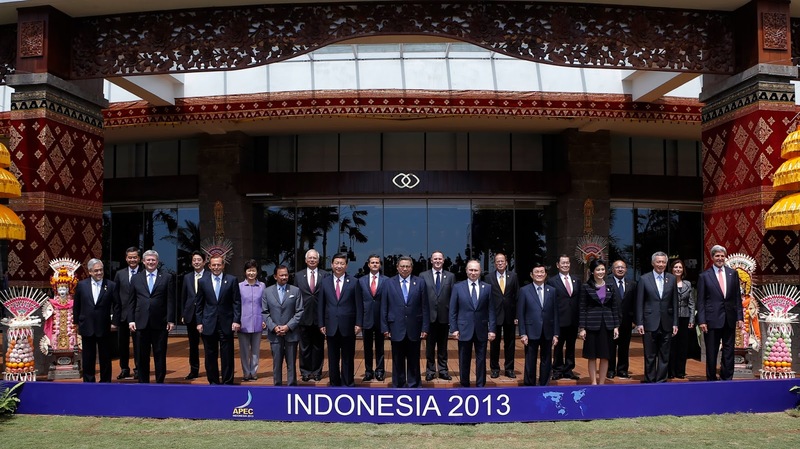 APEC's aim was never to be a negotiating forum. Its guiding principle is “concerted unilateralism”, that is, it has no power to force its members to do anything; it merely seeks to inspire good policy by example and co-ordination. This is where APEC's real accomplishment lies within a region not accustomed to working and coordinating together in a similar way to the the EU regional supranationalism integration. Instead APEC has developed many technical committees doing useful work in areas such as trade facilitation. It helps foster habits of consultation and co-operation. And, furthermore, its Leaders’ meetings provide an opportunity for useful and sometimes informal bilateral talks. Since the Doha round of world-trade talks more or less came to a stand still with almost no hope of moving forward in the foreseeable future, APEC’s ambitions have spread into other areas. This year its motto is “resilient Asia-Pacific: Engine of Global Growth”, and its three main themes are the Bogor goals; improving “connectivity” (infrastructure, harmonising procedures and making it easier for people to travel); and “sustainable growth with equity”. APEC's core interest has always been trade liberalisation. Twelve of its members (including two of the three biggest economies, the US and Japan, but not China) are pursuing the Trans-Pacific Partnership (TPP), an ambitious “21st-century” free-trade pact, covering areas such as labour, government procurement, state-owned enterprises, intellectual property and e-commerce, as well as traditional merchandise trade. Meanwhile, eight TPP members (but not the US), along with four other APEC members (including China) as well as India and three other non-APEC countries are talking about yet another regional trade group, the Regional Comprehensive Economic Partnership. The Latin American member economies, Chile, Perú and México are also pursuing the "Alianza del Pacífico" in the hope that a stronger regional alliance will give them more bargaining power in their trade relations with China. All, this adds up to a very dynamic Asia Pacific region. Hence a possible further grand aim for APEC over the next decade may be to try to co-ordinate these parallel processes, in the hope of bringing them all together in a grand Free Trade Area of the Asia-Pacific eventually. This is a role that APEC is well prepared for given its twenty or more years of existence across the Asia Pacific region and its technical expertise on trade liberalisation. 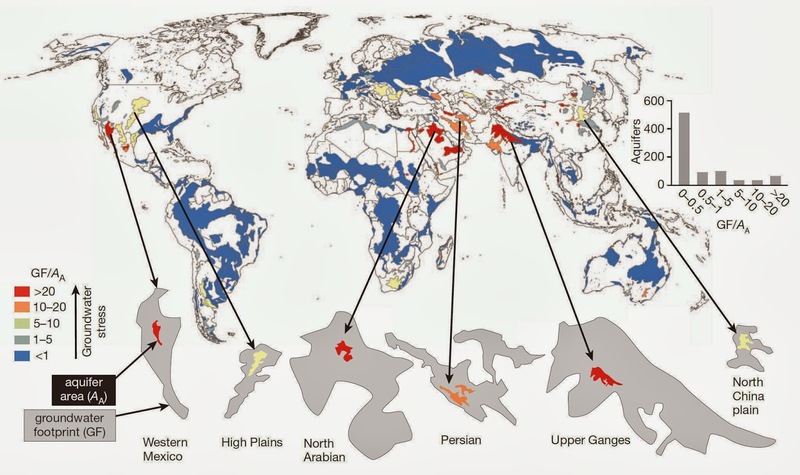 Researchers at McGill and Utrecht University in the Netherlands have recently published a map showing the regions where the use of water from these aquifers vastly exceeds the rate at which they're being refilled by rain. The map compares the usage footprint with the actual rainfall a particular aquifer gets. Blue areas receive more rain than is being used up by humans. For example, Russia has plenty of freshwater. But orange or red areas indicate places where irrigation and drinking water use is drawing out more water from the aquifers than the rain can refill. Nature has decreed that the supply of water is fixed. Meanwhile demand rises inexorably as the world's population increases and enriches itself. Homes, factories and offices are sucking up ever more. But it is the planet's growing need for food (and the water involved in producing crops and meat) that matters most. Farming accounts for 70% of withdrawals. Few of the world's great rivers that run through grain-growing areas now reach the sea all the year round or, if they do, they do so as a trickle. Less obvious, though even more serious, are the withdrawals from underground aquifers, which are hidden from sight but big enough to produce changes in the Earth's gravitational field that can be monitored by NASA's satellites in space. Water tables are now falling in many parts of the world, including America, India and China. Although the supply of water cannot be increased, we can use what there is better—in four ways. One is through the improvement of storage and delivery, by creating underground reservoirs, replacing leaking pipes, lining earth-bottomed canals, irrigating plants at their roots with just the right amount of water, and so on. A second route focuses on making farming less thirsty—for instance by growing newly bred, perhaps genetically modified, crops that are drought-resistant or higher-yielding. A third way is to invest in technologies to take the salt out of sea water and thus increase supply of the fresh stuff. The fourth is of a different kind: unleash the market on water-users and let the price mechanism bring supply and demand into balance. And once water is properly priced, trade will encourage well-watered countries to make water-intensive goods, and arid ones to make those that are water-light. 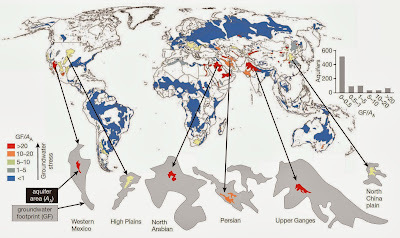 It is too early to tell how we will decide to manage our global water reserves.